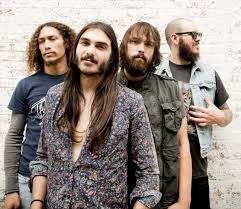 Pottsville, PA based rock band Crobot had an impressive year in 2014. With the release of their brilliant album ‘Something Supernatural’, Brandon Yeagley (Lead Vocals, Harmonica), Chris Bishop (Guitar, Vocals), Jake Figueroa (Bass ) and Paul Figueroa (Drums) had many in the world of rock getting excited about this band, and quite rightly so. ‘Something Supernatural’ is one of those albums that from the very first song you are totally hooked by the sound this band have. From those very first notes on ‘Legend Of The Spaceborne Killer’ with its heavy riffs and lush vocals, you are blown away by Crobot. ‘Nowhere To Hide’ and ‘The Necromancer’ have more of those heavy riffs with a slick rhythm behind soaring vocals that make this album one of the most exciting records to be heard in a long time, whilst’ La Mano De Lucifer’ starts off with a gentle vocal before the thunderous riffs explode into this melodic sounding track . ‘Skull Of Geromino’ which brought the band to the attention on many rock fans, is a hard hitting riff fuelled song that has vocals off the scale and a dirty sounding rhythm, that is an epic crescendo of sound. ‘Cloud Spiller’, ‘Fly On The Wall’, ‘Night Of The Sacrifice’ and ‘Chupacabra’ have more of that signature Crobot sound that is a delight to listen to and immerses the senses in a wall of sound that is heavy, gritty, downright filthy sounding in places and continues an album full of killer sounding songs. ‘Wizards’ has a heaviness to it that is packed full of a tight rhythm and riff based sound, whilst ‘Queen Of The Light’ once again is a slower sounding track, with swirling guitars behind a softer sounding vocal but is still full of power as the vocals rise through the chorus. A bonus track on the album ‘Tapdancing On A Tightrope’ starts with a seductive bass line before the riffs kick in and the drums thump through the track, this track resonates with rock and is a great end to the album. ‘Something Supernatural’ is an awesome sounding album and has cemented the bands reputation as one of the most exciting rock bands to emerge in recent years. Having extensively toured in 2014, including support slots with Chevelle in the US and The Virginmarys in the UK, the band are once again on the road in 2015 and have announced European dates with Black Label Society and will be touring the UK in February 2015. With an album sounding this brilliant, Crobot are a band that you have to see live when they are over here once more. Crobot is the band everyone needs in their music collection and if you haven’t bought their stunning album ‘Something Supernatural’ then now is the time to do so, as you are going to wonder what took you so long. The website for the band is http://www.crobotband.com . They are on Twitter @Crobotband and Facebook https://www.facebook.com/Crobotband The album is available at iTunes and Amazon and they can be heard on Spotify.